A call has gone to the National Assembly to pass without further delay, the Fisheries Commission Bill 2014 before it, with the inclusion of an important component, the Fish Health Management Programme (FHMP). Professor Godfrey Ezeri of the Department Aquaculture and Fisheries Management, College of Environmental Resources Management (COLERM), Federal University of Agriculture, Abeokuta (FUNAAB), stated this during his Inaugural Lecture, delivered recently in the University. 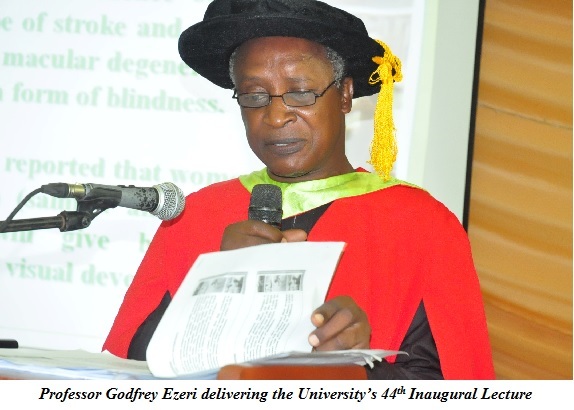 Professor Ezeri’s lecture, which was the 44th Inaugural Lecture of FUNAAB was titled, Fish Diseases: A Major Hindrance to Realization of ‘Fish for All’. According to the Professor ofFish Pathology and Health, the FHMP should be located in the various state’s Agricultural Development Programmes (ADPs), for overall cost effectiveness and sustainability, through which other stakeholders such as the Fisheries Department in the state Ministry of Agriculture, Veterinary departments, Universities, research institutes and non-governmental organisations can effectively participate in the objective of providing fish-for-all. While explaining further, he said with FHMP in place, there will be better monitoring of eggs and fish stocks imported into the country, to ensure that they were certified properly for human consumption. It will also ensure that there are formal registration of fish farms, cold rooms and strengthening of networking opportunities among policy management and research outputs in Universities, research institutes and extension workers. Professor Ezeri’s well-researched lecture revealed that fish was becoming increasingly important in the diet of a large percentage of health provisions, accounting for 40 per cent of animal protein consumed in Nigeria and 16 per cent of consumption worldwide in which about one billion people across the world relied on as the primary source of animal protein. He added that fish is very nutritious, cheap and delicious, as is now “a major source of animal protein in most African and Asian countries”. “The fisheries sector makes a vital contribution to the food and nutritional security of 200 million African and provides income for over 10 million engaged in fish production, processing and trade. Moreover, fish has become a leading export commodity for Africa with an annual export value of $2.7 billion”, he stated. As predicted by the Food and Agricultural Organisation, Africa was capable of meeting up its fish needs. Therefore, to ensure constant supply of fish, the Inaugural Lecturer noted that Aquaculture remained the most renewable, sustainable and cost-effective alternative to fish production that could guarantee fish self-sufficiency even though a deficit of 2.04 million metric tonnes was required to meet the demand for fish in the country and this shortfall is augmented by massive importation of frozen fish. 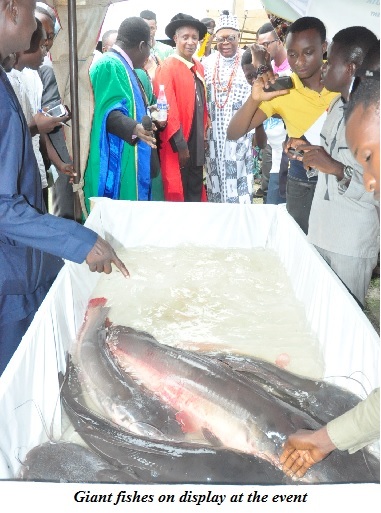 Professor Ezeri, a Fellow of the Fisheries Society of Nigeria (FISON), however, stressed the need to drastically reduce the various fish diseases, to ensure that the supply of fish products were not drastically reduced and thereby constituting a threat to the realization of the fish-for-all objective. He also warned against the infiltration of pollutants, which he said were harmful to both fish and human beings and cautioned against the use of harmful chemicals to harvest fish, such as herbicides, insecticides, rodenticides, fungicides, among others. The don opined that the desire to attain the goal of fish-for-all was laudable but could only be achieved when the necessary machinery was put in place by the stakeholders, as he commended the Federal Government for ensuring that “farmers at the grassroots, got a largesse of 500 juvenile and five bags of floating feeds and hoping that more of the programmes should be sustained”. Speaking at the occasion, the Vice-Chancellor, Professor Olusola Oyewole, charged Nigerian youths to acquire skills that would prepare them for the competitive labour market. “Please, be conscious of the skills and competences you need to acquire which will prepare you for the competitive labour market. Don’t just come to the University with the aim of acquiring the certificate only”, he said. The Vice-Chancellor, who chaired the occasion said the University would not relent in its efforts to further develop knowledge and improve skills by providing an enabling environment and facilities for teaching, research and extension services. According to him, FUNAAB was expecting the sum of N5 billion over a period of five years from the Federal Government, which will be utilized for the purpose of improving the quality of teaching and teaching methods. He also disclosed that the University would be building laboratories which would be of world class standard as well as a new Senate building. While introducing the Inaugural Lecturer, the Vice-Chancellor said the 44th Inaugural Lecturer, was the second from his Department and eighth from COLERM, having supervised over 50 undergraduate, seven Master’s and six PhDs. An alumnus of the University of Nigeria, Nsukka for his First Degree, Professor Ezeri also bagged his Master’s and Doctorate degrees at the University of Jos. He had served the University in various capacities. 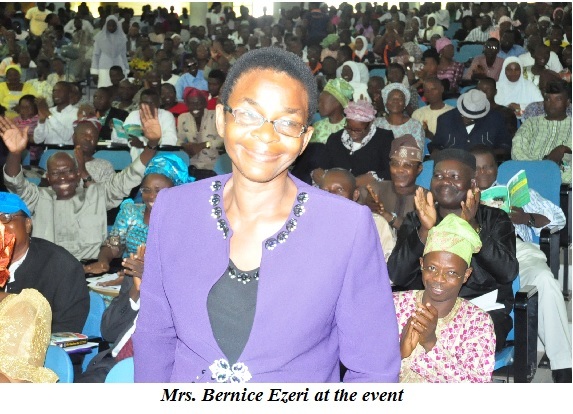 Professor Ezeri was a consultant to both Ogun and Lagos ADPs and had bagged several awards such as the Distinguished Merit Award of FISON, Contemporary Who-is-Who Award and the American Biographical Institute. He belongs to learned societies such as the Institute of Biology, Multi-Disciplinary Aquatic Studies Team and the Nigerian Association of Aquatic Students and he is currently the Editor-in Chief, Journal of Field Aquatic Studies (AQUAFIELD). Dignitaries present at the occasion include Professor Chiweyite Ejike, Chairman, Council for Intellectual Cooperation of Nigeria (CIFICON); Dr. Bola Adekoya, Fellow, Fisheries Society of Nigeria; Mr. Mfu Orji, the Inaugural Lecturer’s secondary school teacher; Madam Margaret Ezeri, mother and Mrs. Bernice Ezeri wife of the Inaugural Lecturer, among others.